6 5/8" tall screw-top flask with top; flask; front: "Squibb" back: "design pat. 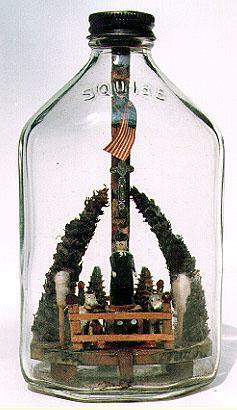 87401 6 1 Bottle made in USA"
This little bottle contains a wooden platform with a railing. A preacher (German Putz toy figure) stands on a red plastic die, flanked by two lambs (also German toys). 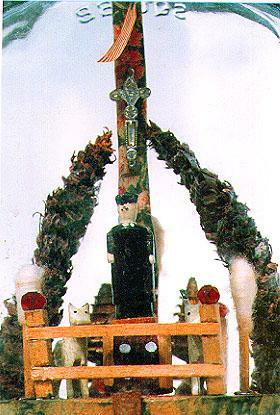 Two long pinecones, coated with green shavings, lean in toward a central shaft which is decorated with a cross made from a piece of jewelry, and a paper American flag. Two posts outside of the railing are halves of Q-Tips.